Yes, I know this weekend officially kicks off the summer season. But if anyone of you live in the DC Metro area, it has been summer since April. The only thing “official” about this weekend is the introduction of humidity…which, ironically, is my kryptonite. So far, this weekend has been quiet which is FANTASTIC in my book. The past couple of weeks have been a challenge and it’s nice to be able to just laze about the apartment. Of course, “laze” simply means more time for my habit/hobby. Even though I made a couch not that long ago, I really wanted to something constructive and challenging. Again, my biggest hurdle in this crazy project o’ mine is the lack of modern but affordable miniature furniture. True, there are vendors online that I can get designer modern stuff. But these are so darn pricey…I mean, I want to have some $$ left over to pay my mortgage you know? So lately, I’ve just been resorting to converting existing pieces into something more to my taste. Like this project. On Saturday, I went back to my local miniature shop because I needed to return some items I purchased last week. Luckily, the cashier was nice to not only let me do the return, but let me convert the return into store credit. With a receipt showing my new store credit, quickly made a beeline to my most favorite part of the store — the clearance bin. 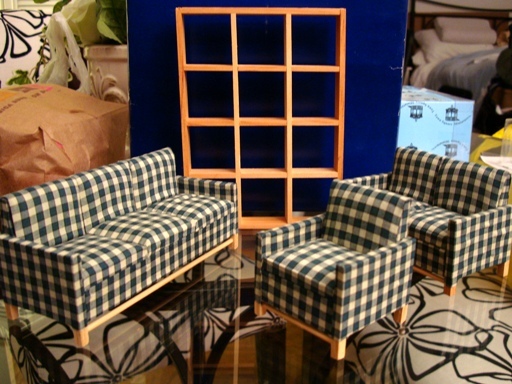 After some digging around, I came across this living room sofa set. 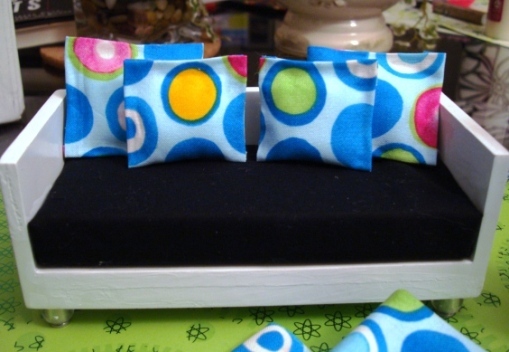 The shape reminded me of the sofas you see at IKEA — just minus the tacky fabric. Figured this can be a worthy set for a conversion project. Plus it’s $12 for three pieces — can’t get any better than that. Also found amongst the garden stuff a wooden shelf that looks so much like the IKEA Expedit bookcase (yes, I am familiar with IKEA because I’m a shameless fan of their stuff…and I used to work there). Once these items got tossed into my shopping basket, I quickly went ahead and purchased them using the store credit…before I started going nuts and buying stuff I don’t need (at the moment). When I got home (spend the rest of the day with BK in Alexandria to enjoy the weather), I unpacked the new items and started to work. Was lucky to find in my trusty bin o’crap some fabric I bought at (where else?) IKEA in their ‘As-Is’ section, as well as the wood coloring markers. After working on them for a couple of hours, I present to you the finished products. Much to my surprise, it looks pretty good. The reupholstering was a lot harder — had to scrape the old glue and stuck fabric from the wooden frames before I could start draping the new fabric. Had to use my sharpest scissors to cut the corners to make them fold neatly (and slicing my fingers in the process). The bookcase, luckily, was an easy one. Had to sand some areas, then colored the whole unit with the marker before applying the varnish. It really does look like the Expedit bookcase. Rats, maybe I should have gotten another one…I can see this being a popular item with the dolls…guess another miniature shop trip is in the works. Need to go back anyways…they had a sign calling for anyone who’d like to be a contractor. 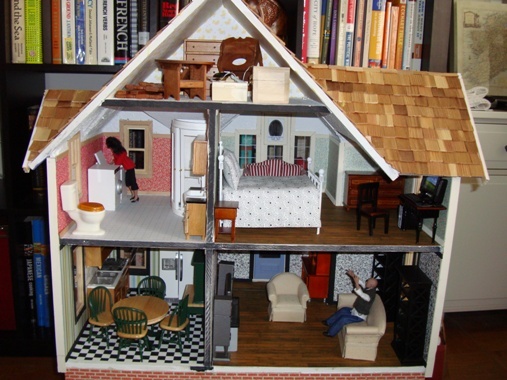 Build/assemble dollhouses, do custom work….wondering if it’s something I should try. BK thinks I should, but I dunno. Something to think about I guess. After everything was completed, I moved the pieces to the Eocháin apartment and set up the kids around it. Maddie enjoys bringing her toys to the couches during playtime (while the resident dogs keep an eye on her). 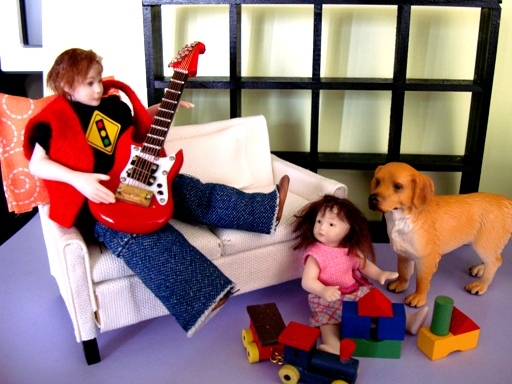 Aidan seems to enjoy lounging on it with his guitar. “Addy, what is that you’re singing?” Maddie asked. “You mean ‘googly eyes’,” Aidan answered. He quickly realized he said too much. Aidan has no choice but to pull out the old and reliable solution against annoying little siblings. *Aidan’s singing the song “A Beautiful Lie” by Thirty Seconds to Mars. Sung by the ever beautiful man Jared Leto of course! The name “Laney” that Maddie used refers to Selene Tremaine. Need to Wipe the Drool….Excuse Me…. 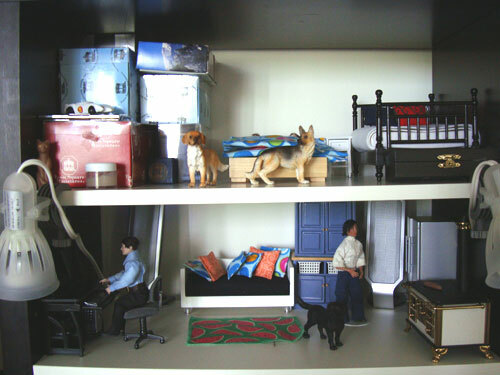 Ever since I came across Modern MC’s Mini Modern blog on her growing (but freaking AWESOME) dollhouse/miniature collection, it’s become a daily ritual for me to check it at least twice a day. Not only does she have a section that shows what interesting pieces are on eBay, but she provides interesting news on products and what not. Take this for example. 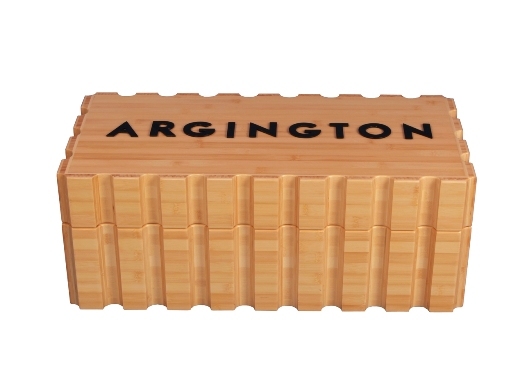 Late Friday afternoon, she posted an alert about how a modern children’s furniture company called Argington had a set of their furniture but in miniature (Modern MC reported the scale to be 1:10 but should work in 1:12 scale). It wasn’t until I got a closer look that I was completely floored. Sadly, Modern MC reported in her blog (and Altera in the comments) that the set is not for sale. Nuts! Just when I was ready to sell a kidney or blood. Or maybe dip into my 401(k). I mean, this counts as hardship right? So Long How Are We Staying Here? “Hun, any word from the contractors about the house?” Daphne asked. 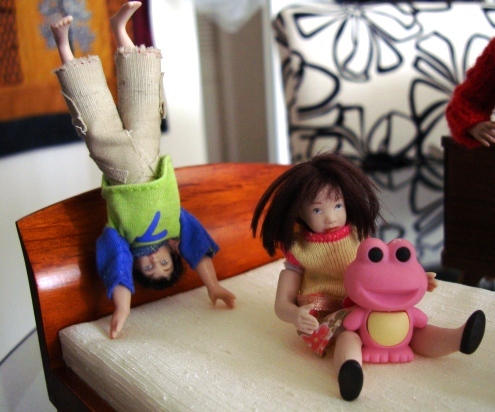 *CIPMC stands for the writer of the blog, aka ‘Crazy Incompetent Pinay Miniature Collector’. Figured I’d use this as the name of the company building the Eocháins and the Valentine-Johnson house…. Despite going to bed around 3 am this morning (see previous post), I woke up a few hours later. Since I couldn’t sleep, decided to pull out the trusty bin o’ crap and see what I can do in the meantime. I had forgotten that I won this daybed on eBay late last year. 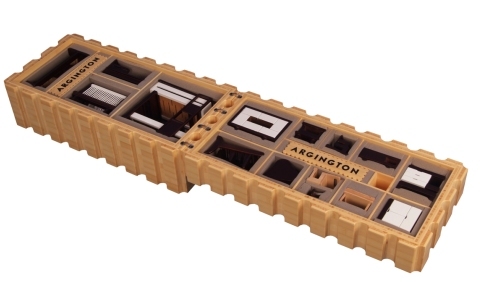 It was listed as a daybed, but apparently it’s a stylish sofa from AG Minis. It was in okay condition — the white paint was chipped in some areas, and the main seat cushion was pretty worn out. Ended up using some nail polish to match the original varnish and covering the old cushion with some scrap fabric. After making the pillows, it looks way better than before. Hmm…think I’ll stop for the day. Suddenly craving a sandwhich, and from the look on BK’s face, looks like we’ll be spending the rest of Sunday outside. Works for me! Ethan and Emily trying out the new temperpedic mattress their dads George and Trent just bought. And more than likely, will have more of these if I continue this habit hobby. With the dining set dilemma still fresh on my mind (and with Friday being payday), I decided to see what I could do. Armed with a goal (or two), my trusty Visa checkcard, and a measuring tape (yes, I always keep it in my purse), I drove down to Once Upon A Time, the miniature shop closest to my place. Even though I made a list and a budget, those fizzled the minute I walked into their dollhouse/miniature section. Three hours later (and at least two purgings of my shopping basket), I finally left the shop elated — and poorer than before.I didn’t exactly find a dining set for the soon to arrive china cabinets. But I did come across this set collecting dust in the shop’s clearance bin. It’s not bad looking — the wood looks like pecan, and the rattan was in excellent condition. Plus, it kinda reminded me of the dining furniture I might see at Crate and Barrel. Of course, unlike CB’s infamous prices, this was actually cheap. The original price was set to $30, but I got it close to 50% off. I dug deeper into the clearance bin (must have been lucky — the shop owner was in the process to marking down and putting new items in the bins during my search. More purchses – woot!!) and came across this bed. BK saw it at a shop up in Frederick MD and noted that it looked similar to my bed back at the apartment. In a way it does — but I wasn’t crazy about the wood color and the bedding. A little too ‘country’, to be honest. On top of that, the price tag said it costs about $80. I dunno about you, but I may be obsessed, but I’m not that crazy. Guess the financial or miniature gods heard my sarcastic thoughts, because a few months later, I find that same bed at my favorite shop. Luckily, the shop keeper gave me a price discount on the spot when she saw me contemplating over it. Thanks Betty for hooking me up! After picking up a couple of more items (I can see my family and friends rolling their eyes if they saw what I bought), I made a quick run at Michaels to see what I could do about changing the wood color. Was worried I’d have to sand the pieces down and apply stain/varnish on them. But a sales person actually suggested that I try using the wood coloring markers instead, and a water based craft varnish. I hope this closes the book the whole dining room fiasco. Two families get two dining sets. And I go to bed one happy (but tired) miniaturist. …a home decor war, that is. If you all recall, I meant to give George and Trent a dining set that I modified not too long ago. But BK insisted that it instead go to the Eocháins instead since it was more to their taste as well (besides, BK argued that the extra seats would be useful if Daphne or Bryan’s parents decided to show up unexpectantly for dinner). So the Eocháins scored the Danish set while the Johnson-Valentine household will get something else. Unfortunately, while surfing eBay, I came across this cabinet. True, it’s from Hong Kong (meaning $$$ in the shipping department). But it’s pretty. And I can’t find this anywhere else. And price-wise, it’s not bad at all. Plus, it would look great in George’s office. Something very traditional — something Trent would probably agree in having in the house. Though he’d probably be putting barricades around to protect it against the resident pair of ankle biters. Or stocking the cleaning closet with either orange oil, Murphy’s Wood Soap, or Pledge (did I share the fact he’s a bit OCD?). Me: Was thinking of putting it in George’s office. Whaddya think? BK: What? It should be in Daphne and Bryan’s place! It’d be a great china cabinet! Me: Whoa there buddy. They already have that Danish set. 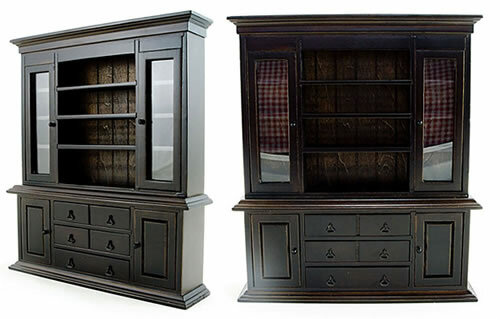 If you want this cabinet in their dining room, then George and Trent get their original dining set back. BK: But I like that set too…. 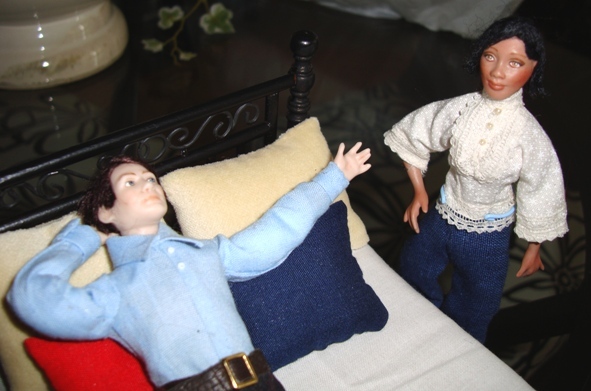 Me: Good lord hun, they’re dolls. I don’t think they’d mind. Seriously, the gmail chat went on like this for a good while. After doing some number crunching and checking the vendor’s other items, I decided on a compromise. I’ll get two of the cabinets (one for George’s office, and another for the Eocháins) and go from there. Though I might give the Danish dining set back to Trent and George. 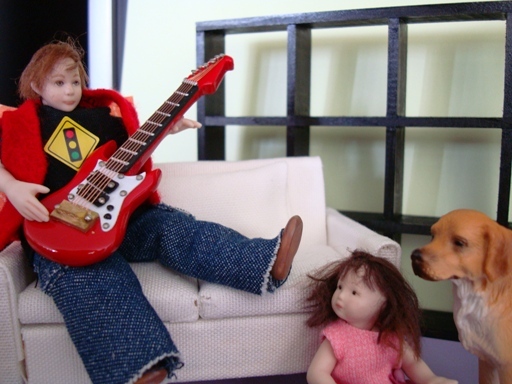 Good thing Trent and Daphne are good friends…. After unpacking some purchases, can safely say that Marcus and Alicia’s house is now open for public viewing. I don’t have the place fully decorated, but the main furniture pieces are in place. Curious what you all think. I’ll probably be adding/subtracting items as time goes along. But at least, the newly weds have someplace they can call home. For the rest of the photos, you check them out at this gallery.